It is also named as the ‘day source’, ‘destiny main’ or ‘source deity’, the core of ‘four pillars BaZi’. It is determined by the birth day. If you try to read a BaZi and there is confusion or a mistake with the birth hour, you can still attempt to make some predictions. However, if there’s a mistake with regard to the birth day, you might as well give up! So remember, the ‘original destiny source deity’ is the heavenly stem of the birth day, or the heavenly stem on the day pillar. Since the [original destiny source deity] is also called the day main, it represents a person’s most intrinsic and fundamental ‘quality and nature’. Psychologically speaking, it is the so-called ‘sub character’ or the ‘subconscious mind-set’; scientifically speaking, it is the person’s basic ‘magnetic field or magnetism’. Those who have Yi Wood as their [Original Destiny Source Deity] would have a nature similar to that of the grass, vines or flowers. The grass and flowers are supple. They can bend as they grow and still display beauty in bloom. She who has Yi Wood as her [Original Destiny Source Deity] is gentle, docile and expressive. She can quickly discern what is beneficial from what is not and always works on further development from her present environment. 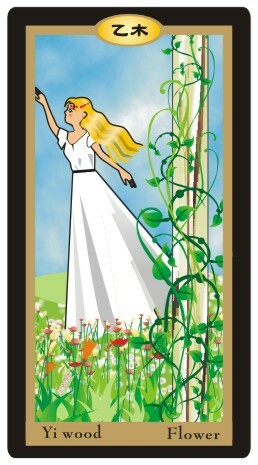 Just as the grass and flowers that are extremely sensitive to the slightest wind and rain, she who has Yi Wood as her [Original Destiny Source Deity] is gifted with great mental agility and can always play the situations by ear. She is no doubt the spokesperson of EQ! Resilience, negotiability and metamorphism are her trademarks. She will not insist on her own opinion. Although the grass and flowers appear to be frail, they can thrive in the harshest environment. They will sway when a typhoon hits. When they are trampled, as long as their roots are still intact, they will not wither easily. Just as the grass sways to the direction according to the wind’s direction, this type of person is very flexible. ‘Extremely practical’ is another way to put it! In regard to money, she will save diligently and seldom squander. You can say that she is more ‘attached’ to money than others. Her weaknesses are being timid and dependent, therefore cannot play any key roles. For all her creativity and quick wit, if things go against her wish, she might fret for nothing, lose her confidence and become a quitter. She might appear to be modest but inside she is really very possessive and calculative. As she might compromise her principle and intention, she scores low in accountability and reliability. She often changes her mind in the face of temptations so she must be wary of the fact that she’s likely to be swindled for small profits. Though the destiny main is Yi Wood with the above mentioned grass tending to ‘dynamic’ features, if your destiny mold is tending to static horoscopes, such as: ‘Zheng Yin、Zheng Guan、Zheng Cai、Shi Shen、Bi Jian、Pian Yin’ etc. Perhaps it will present ‘Dual conflicts personality’! Or its destiny case appears overpowering、thorough stem horoscopes; it means if the same horoscope appears over twice, then, the horoscope’s characteristics would be apparently vivid. The destiny main originality becomes recessive features without obvious notice.